Another week where there’s not that much to report on the writing front. I’m still waiting to hear my publisher’s views on The Beholder, so there’s not a great deal that I can be getting on with at present, short of thinking about book four (which is certainly on my mind, although I’m not ready to say too much about that yet). So with my author hat temporarily hanging from its peg, I’ve donned my DIY enthusiast hard hat and ventured outside to enjoy some balmy April sunshine. Last week I finished making the windows for the outbuilding in our garden and moved on to fashioning a timber door. After months spent hunched over a keyboard it’s good to get some fresh air and physical exercise, and the simple process of working with my hands rather than my mind gives me a certain sense of rejuvenation ahead of my next writing endeavour. It also allows me to listen to lots of music, and I’ve dug out a few old favourites as you’ll see from this week’s listening list below. It’s a case of same as you were this week, as Justice For All remains on sale, Blood Law is waiting to be unleashed on the 17th July, and The Beholder is with my publishers for comment, leaving me time to tackle some DIY projects in the garden (the latest of which involves making windows for an outbuilding we inherited when we moved in). So with little else to report, I’d best fetch my saw and crack on! I’m really pleased with it, and I think that my publisher, MIRA, have done a great job. The shot of the L.A. skyline across the base of the image echoes that employed on Justice For All’s cover, providing continuity and highlighting the urban theme of my books, while the image of Hunter in profile works on two primary levels; firstly, with head slightly bowed he looks like a troubled man with the weight of the world on his shoulders, and secondly, the gun clasped in his hands shows that he’s ready to do something about whatever problems he faces. The back cover then provides a great teaser as to what the book is about, along with some praise for JFA. Please click on either image for an enlarged version. 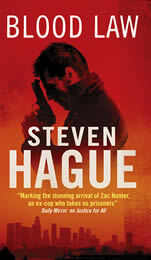 Blood Law comes out in the UK and Eire on the 17th July 2009, and I’d love to hear what you think of the cover! In other news, the up and coming men’s quarterly, ‘1 Degree’ features a lengthy extract from Justice For All in its current issue. Copies of the magazine are available from Borders, while you can check out the on-line edition at www.1degreeonline.co.uk. My thanks go to the magazine’s editor, Suzannah Sorrell, for her kind support, and with any luck an interview with yours truly will follow in their next issue. There’s been no blog for the last couple of weeks as I’ve been on vacation in Borneo. While I won’t bore you with all the details (or make you sit through the hundreds of photos I took), suffice to say that it’s a beautiful country filled with marvellous people, and I’d like to give a shout out to all my new friends at the Kinabalu Club! The first thing I did on my return was to check my e-mails as I’d been eagerly anticipating one from my publisher, and sure enough it was there in my inbox. The e-mail contained the concept art for the cover of Blood Law, my second novel that’s due out on the 17th July. I was a little nervous as I went to open it, as the designers had set the bar high with their sterling work on Justice For All, but I needn’t have worried as it turned out they’d really outdone themselves. The cover was fantastic, continuing the gritty urban theme that had been established with JFA, and offering the first glimpse of my main man Zac Hunter in profile. I’m really pleased with it, and I can’t wait to share it with you all, but I’m afraid that you’re going to have to wait a little bit longer as I haven’t got confirmation that it’s ready for public consumption yet, and on that teasing note, I bid you farewell!